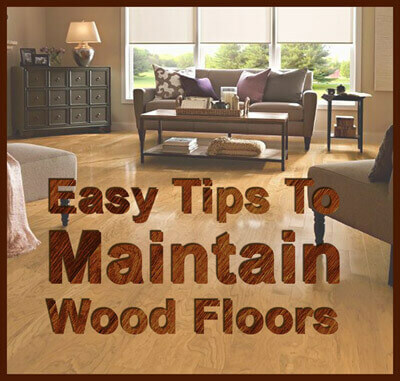 Here are some of the best hardwood floor maintenance tips we can offer to help you protect and extend the life of your hardwood floor. For the first two weeks after installation, use your floors with care. During these first two weeks, avoid using water or placing any rugs or carpets on your floor. We recommend that no furniture be moved into the room for two or three days. To help the floors cure faster, provide the floors with adequate air circulation by opening windows or allowing fan ventilation. Regularly vacuum or use an untreated dust mop on your floors to remove sand and grit that may lead to premature wear. Use a soft cotton cloth and BonaKemi Hardwood Floor Cleaner (available at Carter Wood Floors) to clean up wet spills. Do not damp mop your floors. Repeated mopping will wear the finish down prematurely. Instead, just wipe the floor according to the BonaKemi Hardwood Floor Cleaner label directions. Do not use oil soap or other household cleaners on your floors. These products can dull the finish and make future cleaning and refurbishing difficult. Do not wax your floors. If wax is applied, it will not be possible to recoat the floor. Polyurethane cannot be applied over wax and other household cleaners. Use felt protectors on the "feet" of furniture. Felt protectors allow chairs to move easily without scuffing. Clean and replace felt as needed. Never drag furniture over the floor, as this can result in serious damage. Always lift furniture or move it using floor protectors. Avoid walking across the floor in high heels as much as possible, and make sure all heel caps are in good repair. Place mats at exterior doors to trap sand and grit from incoming foot traffic. Use area rugs at floor transition areas: at the bottom of the stairway, in front of doorways, etc. Avoid area rugs which are rubber-backed and any other type of rug which will not allow the floor to breathe. Recoat the floor regularly. Recoating is preventative maintenance. When the floor begins to show wear, it is time to recoat. Do not wait until the finish has worn off and dirt and spills begin to penetrate the wood. If this happens, a far more intensive sanding procedure will be required to restore the floor's finish.